Disclosures up front: I am a member of the NSW Greens. I was involved in two local Legislative Assembly campaigns that chose not to direct preferences, and argued in favour of that choice. I was involved in the state campaign, but I was not involved in making the Legislative Council preferences decision. I consider Jeremy Buckingham, the Greens’ 3rd Legislative Council candidate, a friend, I hope he will be elected to the Legislative Council, and I think he will make an excellent progressive MLC. Did the Greens preference Pauline Hanson? No, this is entirely false. Jeremy Sear provides the evidence. The Greens’ how-to-vote cards for the Legislative Council (upper house) only recommended giving a first preference to the Greens and did not recommend any further preferences. There are no Group Voting Tickets, in which a party dictates where preferences flow when a voter only writes a 1 in the box for that party, because NSW has optional preferential voting. In other words, parties cannot control preference flows in a NSW state election, and the Greens did not recommend that voters direct their preferences anywhere, let alone to Pauline Hanson. To the enduring disgust of the Labor Party, the Greens chose to direct preferences to the One Nation founder ahead of the ALP, and she may now creep into the Upper House courtesy of their support. Indeed it may yet squeak home in the final upper house seat – edging out Pauline Hanson which the party had mystifyingly preferenced ahead of Labor, to its enduring shame – and is still something of a chance in Balmain. Penbo has since authored a public refusal to correct his false statement, although he resorted to lying about what his original article said in order to make it sound defensible. The claim remains utterly false. Did the Greens make it possible that Pauline Hanson will be elected? No. That’s an empirical question, and on empirical evidence it’s clearly false. Here’s where things really stand. The Legislative Council fills 21 seats at each regular election. Although the official results will not be declared for another week or so, the winners of the first 20 seats are already clear. It’s the final, 21st seat that remains contested. All above-the-line votes, which are the vast majority of ballots, have been counted. On that count, the Greens’ third candidate, Jeremy Buckingham, leads the race with 0.45 of a quota. Hanson (Group J) is second, with 0.41. Behind them there is a considerable gap to Family First (0.31) and then Labor and the Fishing Party (0.29), so it’s effectively a two-horse race. At the moment below-the-line votes are being entered, after which preference distribution will take place. As each party is eliminated, any preferences voters assigned will flow across to one of the remaining parties. But it is clear that the final contest for seat 21 will be between Buckingham and Hanson. There aren’t going to be enough preferences to raise anyone else into the top two positions. Preferences from Greens voters will not flow to anyone else, which means they can’t have any impact on the outcome of the Legislative Council election. Could the Greens have made it possible for Pauline Hanson to be elected? It is one of those cases of both sides being right. It is true as the Greens say that under the new NSW system that preferences haven’t mattered. But that doesn’t mean they won’t matter in 2011 or in the future, which is where Labor is right. So, could Greens how-to-votes recommending second preferences to Labor have made a difference in the 2011 election? We can’t answer this question empirically. The policy case for not preferencing Labor was spelled out by David Shoebridge — you can read it and agree or disagree with the argument he puts on behalf of the Greens. The impact on first preferences to the Greens.Kristina Keneally’s Labor government was severely on the nose, so that more voters than ever wanted to opt for someone other than Labor. If the Greens had been directing preferences to Labor, it’s all but certain that the party would have been painted as propping up a failed government, and remaining wedded to Labor even when they were beyond salvation. The Coalition would have had a field day, the media would have tied the Greens to Labor for the remainder of the campaign and, I’d argue, instead of achieving their highest ever primary vote in NSW the Greens might have suffered a loss in support. The extent to which NSW voters follow how-to-vote recommendations. As Antony Green’s analysis shows, most NSW voters opt to only give a first preference and then exhaust. This is one of the reasons why preferences have made no difference in previous upper house elections since NSW moved to the optional preferential system. There simply aren’t enough preferences to matter, unless the count is very close. This raises the question of how many Greens voters would have actually followed a direction to give their second preference to Labor, if the HTV had included it. But equally, I would question how many voters chose to do so anyway, even without a recommendation on the HTV. I did so myself (below the line, putting several Labor candidates lower — I’m looking at you, Mr Roozendaal), and have spoken to other people who voted similarly. In short, it’s my opinion that Greens voters who didn’t want to back Labor would not have followed a ‘vote 2’ recommendation even if it had been made, and I suspect that those Greens voters who wanted their preferences to flow to Labor voted accordingly, even though the how-to-vote card didn’t instruct them to do so. In short, I don’t think there’s a compelling argument that the Greens directing preferences to Labor would have had a significant effect on preference flows, even if that had ended up being important to the final result. Did the Greens’ preference decision result in a right-wing controlled upper house? Here is the composition of the Legislative Council going into this election. Labor and the Greens had 11 of the 21 continuing MLCs; the remaining 10 were Liberals, Nationals, Christian Democrats or Shooters and Fishers. In the current 21-seat election, if those conservative parties won 12 of the 21 seats then they were assured of a working majority. Given that the upper house counting shows the coalition winning almost 50% of the first preferences, with the Christian Democrats, Shooters and Fishers, Family First, etc., taking that proportion up to around 60%, while Labor and the Greens combined received around 35% of the vote, it was inevitable that the conservative parties would win more than 12 seats. The fact is that Greens preferences could only have mattered for the 21st seat, and on the 20 seats already decided the coalition can pass legislation through the upper house with support from the Christian Democratic Party and the Shooters and Fishers, as they hold a total of 23 seats. Even if Pauline Hanson isn’t elected, this will remain the case. Even if Andrew Ferguson had been elected, this would have remained the case. How many seats did the Greens’ preference decisions cost Labor? The minor party cost Labor half a dozen seats at last weekend’s poll because it would not preference Labor, Mr Albanese said. The complexion of the new NSW Parliament owes much to them. It has been rendered much more conservative than it would otherwise have been, with Labor losing at least six seats to the Liberals which it would have held if it had received Green preferences. It’s not entirely clear which seats they’re referring to, but presumably they’re suggesting that there are six marginal lower house seats where the ALP + Greens primary votes outweighed the coalition’s primary. I’m not going to go into a detailed analysis, but that argument again relies on an assumption that directing preferences would have resulted in all Greens voters following those preferences, and also that the preference direction wouldn’t have depressed the Greens’ primary vote. That seems no more compelling with respect to Legislative Assembly seats than it did for the upper house. Does not directing preferences to Labor mean that the Greens think they’re equivalent to Pauline Hanson? I’ve seen the argument made (several times now) that by not recommending a second preference to Labor over other parties, the Greens were essentially saying that there is no difference between any of the parties. I think there’s reasonable room for difference in people’s philosophy about what how-to-vote recommendations mean, but in practical terms this isn’t how things operate in New South Wales. With optional preferential voting, as noted above, most voters don’t assign preferences, and certainly very few voters assign them to all parties. Similarly, even when parties do recommend preferences, they don’t usually go beyond recommending a 2nd preference — on election day I didn’t see any HTVs being handed out that recommended filling out more than two upper house boxes. And if this reasoning is applied to the Greens, then its implications for other parties begin to appear absurd. 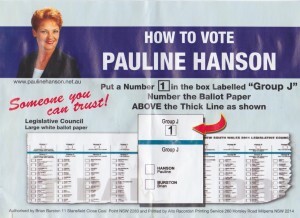 As you can see above, Hanson herself didn’t direct any preferences — does that mean she considers the Coalition and the Greens equally bad? When made by Labor, this argument — as well as the argument that they “tried to stop an ultra right upper house” runs against the fact that some Labor how-to-votes did not direct preferences to the Greens. Here’s one example; I’ve seen others. I don’t propose that the Greens have any right to complain about not receiving Labor preferences. But I do think it’s difficult to swallow claims that Labor held a preferencing position based on ideological principles when they withdrew at least some preference recommendations after failing to secure quid pro quo. If Pauline Hanson is elected, who will be responsible? More than anyone else, it will be the approximately one in 50 voters who gave her their first preference. It might not please many in the remainder of the electorate, but she has gained nearly 2% of the vote. She couldn’t have any chance of winning a seat without a substantial body of support. Welcome to democracy. And, having said my bit about preferences, this final observation points to where we should be focused now. Whether you’re a Greens supporter, a Labor supporter, or a progressive voter who isn’t aligned with any party, the reality is that last month the majority of voters gave their first preference to a conservative party. The conservative parties will retain their majority in the upper house in 2015, unless a substantial number of voters can be persuaded to change their vote. Time to get on with it. ELSEWHERE: Follow-up posts about Penbo and Kenny’s articles from Jeremy and Dave at Pure Poison. Ben Raue’s analysis at the Tally Room is worth reading, too. And Antony Green had two posts on the Legislative Council counting last week — here is last Monday’s post and here is last Thursday’s. And Seamus Lee has a post about the counting progress. I asked the question because there has been plenty of discussion about who is “to blame”. As I noted in my answer, the reality is that if she is elected, it’s more than anything else because enough voters have chosen to give her a place in parliament. I am interested in the idea that her policies have a place, though. Can you tell me what policies she campaigned on? I checked her web site but there doesn’t seem to be much beyond a picture of her in front of a flag and a how-to-vote card. I know her traditional issue was opposition to immigration, especially from Asia, but that’s not really a state issue. The Green eco-extremist genocidalists *have* been elected. Who is responsible? See my answer about Hanson. More than 11% of voters gave their first preference to the Greens in the upper house, so once again the voters are responsible. It seems that at least one in ten voters not only disagrees with the terms you’ve used to describe the party, they consider them the best available option.